…but I’m not going to tell you what it is. Because, well, suspense is fun sometimes. So I thought I’d just note that I’ll be telling my news on my blog on Monday, so stay tuned! It’s been a pretty decent day! The morning started out not-so-cheerworthy though. Annabelle woke up at 4 a.m. We somehow fed her bed for an unknown period of time (medicine port came open again, GRRRR!) And after I changed her formula soaked bed, she pooped with darn near the force of Old Faithful itself, thus messing herself and the bed yet again. And Annabelle HATES baths, so she was none too pleased with this. Then it was fighting (er, speaking in sweet, motherly tones) to my kids to get them out the door on time. Oh, and Karalynn coming in and telling me she flushed the toilet only to have it overflow. Yes, I went to the hall bathroom, and it was covered in water. Yellow… water…. if you get my drift. I threw down blankets, closed the door, and yelled (er, asked politely) for my husband to deal with the problem. But then… then I found out my aforementioned news. And forgot about leaky toilets, gtubes, and baby bottoms. Besides a rough start, Annabelle had a fantastic day! She even had fun playing with sister Lacy’s guitar! It was SO SO SO funny! She was plucking those strings with a vengeance. She LOVES playing with things, and when they make fun music, oh my. She was fascinated for hours! She even found that she could take her little linky ring toys and use them for a makeshift pic. Oh, and it was another completely oxygenless day! AND, I put her to BED without it tonight too. I may have to put it on her later tonight, but she did GREAT last night on only the smallest whiff (like, was satting 98 – 100) and she HATES it when we take it off and put it back on, so I thought I’d give her a shot. So far, she’s doing great! I can't wait to hear your news and I so happy to hear your day ended on such a good note. Woo hoo for no oxygen today! Way to go Annabelle! Sooooo precious! Praying for an oxygenless night and sweet dreams for everyone! I'm so glad that despite the messy start your day went well. Love that pic. 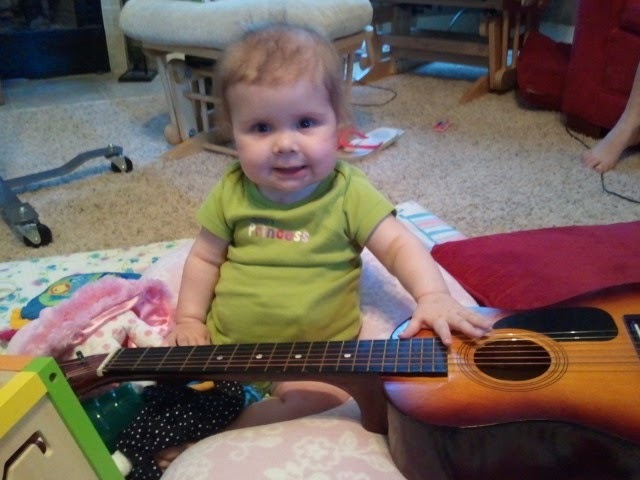 How fun to have Annabelle so enamored with the guitar. Maybe all those songs her dear daddy has played for her has instilled a real love of music. I'm very eager to hear your news. I love that picture of Annabelle! Y'know, I realized how sweet it is to see her SMILE in her pictures these days. I remember most (or all?) of her pre-transplant pictures didn't have smiles in them. What a blessing!